Context: Radiological investigations play a pivotal role in the diagnosis and treatment of a wide range of procedures. Aim: To assess the knowledge regarding adverse consequences of radiological examination and encourage awareness regarding radiation protection amongst general public. Settings and Design: A questionnaire-based cross-sectional study conducted amongst patients visiting the dental outpatient department. Materials and Methods: 1,000 adult male and female patients within the age of 20–70 years who visited the outpatient department during May–July 2017 were included in the study. Statistical Analysis: Comparison of frequencies of responses to each item with age and gender was done using chi square test. For all statistical tests, P < 0.05 was considered to be statistically significant, keeping α error at 5% and β error at 20%. Results: 85.3% participants had visited a hospital earlier and 69.3% had undergone the procedure of an X-ray earlier. Out of those patients, only 24.7% of the participants had any knowledge about the equipment or the procedure while taking a radiograph. 5.2% of the participants were given any safety measures during the radiological procedure. 14.4% had knowledge of the risks and hazards associated with radiation. Conclusions: This short study showed that there is a need for educating the general population about the hazards and risks associated with radiation exposure. Since their discovery, the use of X-rays has always been indispensable in the field of medicine and dentistry. Radiological investigations play a pivotal role in diagnosis, management and treatment planning. Be it simple procedures like the diagnosis of caries or something complex like placement of implants, radiographic examinations are of utmost importance. The radiographic modalities used by a dentist range from an Intraoral Periapical radiograph to newer advances such as cone beam computed tomography. Dentists use radiographs more often as compared to other medical specialties. However, the use of ionizing radiation is associated with potentially harmful biological effects. These effects depend on the duration and the dose of radiation exposure. High radiation doses result in cell death, whereas low doses cause damage or alteration of the DNA of irradiated cells. Though the hazards caused by dental radiography are relatively small and negligible, some epidemiological studies have reported a higher prevalence of thyroid and breast cancer in female dentists and melanomas in male dentists. Although radiation doses in dental practice are relatively low, the cumulative effect of repeated exposure should be kept in mind. The biological effects of ionizing radiation are mainly of two types – deterministic and stochastic effects. The deterministic effects occur after a threshold level; the severity of response is proportional to the dose and results in cell death. The stochastic effects follow an all or none response, do not exhibit a threshold level, and the probability of occurrence is proportional to the dose. Exposure to ionizing radiation causes both deterministic as well as stochastic effects depending on radiation doses and response of the human body to the radiation exposure.,, Since the stochastic effects do not follow a threshold dose, the dentist and the patients are more prone to such effects. All healthcare professionals are trained for radiation hazards and the required safety measures are imparted, but it needs to be assessed as to how sincerely this knowledge is imparted towards the patients. 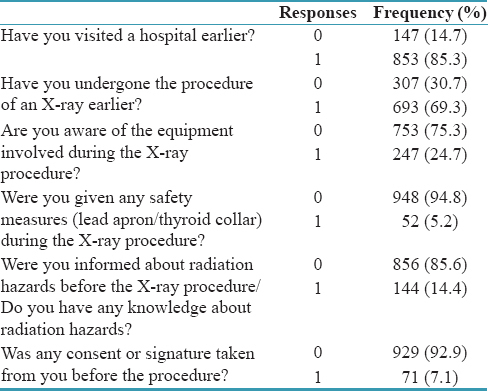 The aim of this study was to assess the knowledge and attitude among general population regarding adverse consequences of radiological examination; and to encourage awareness regarding radiation protection amongst general public. A questionnaire-based cross-sectional study was conducted among 1,000 patients who visited the out-patient department during May–July 2017. Clearance was obtained from the institutional research and ethical committee. The questionnaire was validated by two radiologists from the Department of Oral Medicine and Radiology. After the complete dental examination, the patients were asked a questionnaire by a single observer. All adult male and female patients who reported to the out-patient department, with age range of 20–70 years were included in the study after obtaining a written informed consent. Patients who required any emergency treatment, medically compromised or syndromic patients were excluded from the study. The questions were asked in a language easily understood by the patient. The responses to the questions were marked as either Yes or No. The six questions asked to the study participants are presented in [Table 1]. Data obtained was compiled on a MS Office Excel Sheet (v 2010) and was subject to statistical analysis using statistical package for social sciences (SPSS v 21.0, IBM). Where P = estimate of the expected proportion and d = desired level of absolute precision. In order to avoid gender bias, the study population consisted of 500 males and 500 females. There were 346 participants in the age group of 20–29 years, 238 between 30–39 years and 416 participants were more than 40 years of age. The demographic details of all the study participants are presented in [Table 2]. 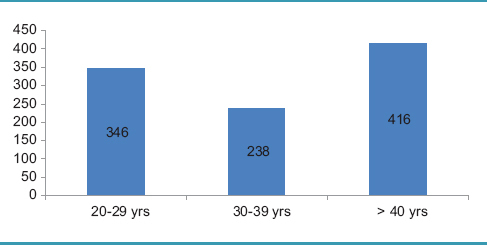 The age-wise distribution of the study participants is presented in [Table 3]. The mean age of the participants as presented in [Table 4] was 37.70 + 13.10 years. The results showed that majority of participants (85.3%) had visited a hospital earlier, out of which, almost 2/3 of them (69.3%) had undergone the procedure of an X-ray done earlier. 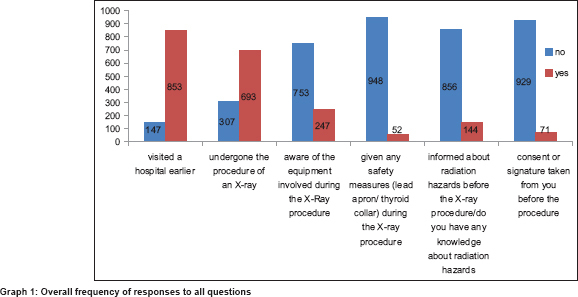 Out of those patients, only 24.7% of the participants had any knowledge about the equipment or the procedure involved while taking a radiograph and only 5.2% of the participants were given any safety measures such as a lead apron or a thyroid collar during the radiological procedure. Of the 1,000 participants, only 14.4% had knowledge about the risks and hazards associated with radiation. Even though the study population consisted of female patients of child-bearing age, very few of them knew that radiation could be hazardous during pregnancy. Out of the patients who knew about the risks associated with radiation exposure, majority of them responded that radiation exposure could lead to cancer. 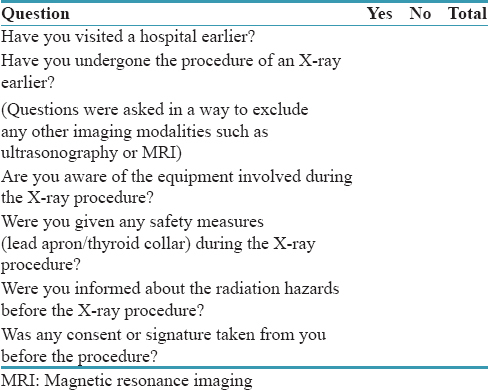 Before the radiological procedure, consent was obtained from 7.1% of the study participants [Table 5]. From the results, it was found that radiation knowledge and awareness were generally inadequate and poor, irrespective of the age and gender of the population. The overall frequency of the responses of the study population to the questionnaire is presented in [Graph 1]. Radiographic examination is an integral part of clinical dentistry for the diagnosis and treatment of majority of the patients; hence radiographs can be referred to as the clinician's diagnostic aid. Most patients visiting a dentist undergo a radiographic procedure; it may be an intraoral periapical radiograph, bitewing radiograph or a panoramic radiograph for the accurate diagnosis of their disease. The radiation exposure caused by an intraoral periapical x-ray is much lesser as compared to other modalities like CBCT or a CT scan. Nevertheless, the cumulative effects caused by radiation exposure should not be neglected. Radiologists are trained about radiation hazards and the deleterious effects caused due to radiation exposure, but it has been observed that only a few radiologists meticulously follow safety procedures for themselves and for the patients during a radiological examination. Also, information regarding harmful effects caused by radiation exposure is not adequately given to the patient. During some instances, patients are exposed to a higher dose of radiation or for longer duration than the recommended exposure time, and are still unaware about the hazards that they could cause to their body. Radiation is extremely harmful to pregnant women and growing children. If a pregnant woman is subject to a radiological examination, it can have deleterious effects on the fetus such as permanent developmental aberrations and anomalies, carcinogenic changes and in severe cases, intrauterine death of the fetus. Therefore, it is better to avoid or postpone radiological examination during pregnancy. In an emergency situation where a radiological examination is indispensable, it should be carried out with proper care. Safety measures such as lead apron and a thyroid collar should be worn by the patient. Numerous studies have been done in the past regarding the attitude, awareness and knowledge regarding radiation and their associated risks and the practices followed by general dentists and the paradental staff during a radiation procedure. In a recent study, it was found that practicing radiologists need to be motivated to follow the guidelines of radiation protection. Agrawal et al. (2015) stated that 48.46% of general dentists in Rajasthan, India had poor knowledge and 49.07% had moderate knowledge about radiation protection in dental radiology whereas only 2.45% had good thorough knowledge about radiation protection techniques. Very few studies have been done in order to find the awareness of the radiation hazards and the necessary safety precautions to be taken during a radiological examination. To the best of our knowledge, only two studies have been carried out in the past to find the knowledge and awareness of the general public. It was found that the awareness and knowledge of the general population in a hospital in Saudi Arabia was unsatisfactory. A study among the non-radiologists in London also showed that the radiation dose was underestimated by the respondents. In our study it was found that radiation awareness is inadequate in the general population visiting the hospital. Even though most of the patients had undergone an x-ray procedure earlier, very few of them were informed about the risks associated with the radiation exposure. It is necessary that the practicing radiologist provide the information to increase the radiation awareness amongst the general public. It is the moral duty of the doctors to inform the patients about the associated hazards and give proper safety measures while carrying out any radiological investigation. The patients should be educated regarding the adverse consequences of radiation with special emphasis for pregnant women and risks to the fetus. This was a short study conducted for a smaller population which showed that there is a need for educating the general population about the hazards and health risks associated with radiation exposure. The data collected through this study could provide a baseline for similar studies in the future on a larger population. Singh V, Singh V. K., Shankar P, Singh D, Lakhani P, Tutu S, et al. Knowledge among general public regarding adverse consequences of radiological examination. World J Pharm Pharm Sci 2015;4:964-9. Agrawal B, Dosi T, Hazari A, Maheshwari C, Rajput R, Yadav N. Evaluation of Radiation protection awareness amongst general dental practitioners of Western Rajasthan in India. J Int Oral Health 2015;7:51-5. Little MP, Wakeford R, Tawn EJ, Bouffler SD, Berrington de Gonzalez A. Risks associated with low doses and low dose rates of ionizing radiation: Why linearity may be (almost) the best we can do. Radiology 2009;251:6-12.
International Commission on Radiological Protection, 2007. The 2007 recommendations of the International Commission on Radiological Protection. ICRP publication 103. Ann ICRP 2007;37:1-332. United Nations Scientific Committee on the Effects of Atomic Radiation. UNSCEAR 2006 Report to the General Assembly, with Scientific Annexes. Effects of Ionizing Radiation. Vol. I. Report to the General Assembly, Scientific Annexes A and B. New York: United Nations; 2008. Whaites E, Cawson RA. The Radiographic Image in Essentials of Dental radiography and Radiology. 1st ed. Harlow (Essex- England): Longman Group of Publishers; 1992. p. 3-7. White SC, Pharoah MJ. Oral radiology: Principles and Interpretation. 6th ed. St. Louis, USA: Mosby; 2009. Wootton R. The POPUMET regulations: Careless radiology costs lives. Br J Hosp Med 1991;45:133. National Radiological Protection Board. Patient dose reduction in diagnostic radiology. Natl Radiol Prot Board 1990;1:3. Brent RL. The effect of embryonic and fetal exposure to x-ray, microwaves, and ultrasound: Counseling the pregnant and nonpregnant patient about these risks. Semin Oncol 1989;16:347-68. Aravind BS, Joy ET, Kiran MS, Sherubin JE, Sajesh S, Manchil PR, et al. Attitude and awareness of general dental practitioners toward radiation hazards and safety. J Pharm Bioallied Sci 2016;8:S53-8. Quinn AD, Taylor CG, Sabharwal T, Sikdar T. Radiation protection awareness in non-radiologists. Br J Radiol 1997;70:102-6.